My submission for the August challenge: turning water into air. 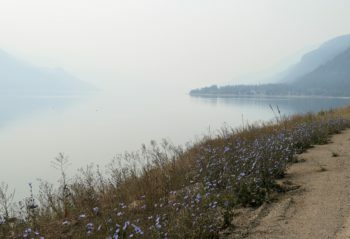 This photo is taken of Lake Kootenay on a quite smoky day, about 20 miles north of Kaslo. The smoke unfortunately spoils our view of the spectacular scenery this area is renowned for, but it does create interesting visual effects. On the horizon, the lake … Continue reading "Water alchemy"
I won’t pretend that it didn’t sting a bit to have not one, not two, but THREE responses to my first July submission chiding me for failing to place a bicycle out in the pasture next to that beautiful Cockshutt 30 we encountered. 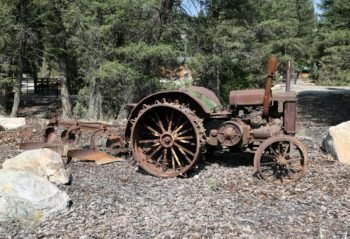 It felt unfair at the time, but since then I’ve had my … Continue reading "Oh, Deere!" Rachael and I are on tour up in Canada this month, and between riding, eating and maintaining our tour journal I haven’t freed up much time for keeping up on Cycle365. 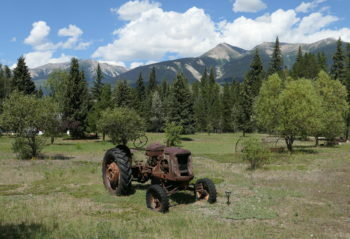 We’re in beautiful Jasper today, not enjoying its famous scenery because it’s overcast and raining. On the upside, I have some free time to … Continue reading "July’s challenge: the Cockshutt 30"